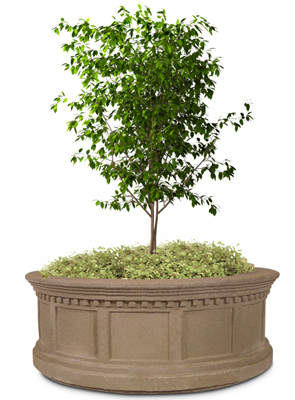 These victorian style planters surpass any industry standard for strength and durability. Ideal for planting large shrubs or small trees, concrete planters can support more weight than resin or plastic planters and can also serve as useful security barriers. Planters feature intricate square detailing around the entire base that will complement any environment with classic architectural elements. Concrete planters are useful when needing to contain root systems of larger plants that may split less durable planters. Concrete planters can be safely placed outdoors to insulate plant roots or can be kept inside as decoration in malls or large lobbies. All planters come standard with drain holes for proper drainage. Available color options and finishes shown below.